Newman Grove senior David Plugge in front of the record board. 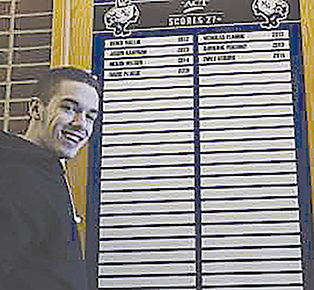 Recently, Newman Grove Schools installed a record board promoting ACT scores higher than a 27. David Plugge, a member of the class of 2019, has been added to the record board. The ACT test score is an indication of how well prepared students are for college. The higher the score, the better the preparation and, with that, more scholarships become available. The highest one can score on the ACT is a 36. The school has a list of all those who have achieved that goal as far back as records go, and have compiled them, which are now available. Names of those from 2010 to present are placed on the board and those who earn the honor now can personally place their name on the board.